This is a complete fuel line assembly for a Mercury Engine. It features a Clip-on Tank Connector and a Clip-on engine connector. This is a complete fuel line assembly for a Mercury Engine. It features a Clip-on Tank Connector and a Clip-on engine connector. 3/8″ hose only. This is an EPA – CARB Compliant FUEL LINE ASSEMBLY! Free Shipping to the Continental U.S.A! This is a full fuel line assembly that includes our high quality primer bulb, premium A1 hoses and the engine and tank connectors. The fuel line hoses are the standard 18 inches to the tank and 54 inches to the engine. (We can custom make these hoses to any length you want and usually in less than 24 hours. Please call 1-877- 786-0606 for more information. ) Pictured below is what a full fuel line assembly looks like. 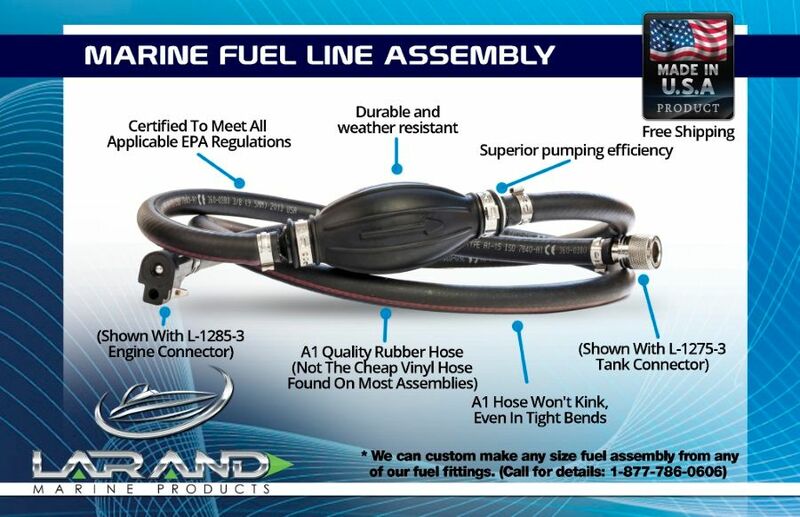 Why Buy Your Fuel Line Assembly From Larand Marine Products? 1) We Are The Manufacturer and have been making these products since 1961. We are based in South Florida and anything you purchase is built by us and shipped out by us. That is why we are the only supplier on the Internet who is able to offer customization of the fuel line assemblies. Want a longer or shorter hose? Give us a call and we can usually have one shipped out to you in less than 24 hours. 2) We Ship Very Fast! We make every effort to ship out orders as soon as they come in. If you order before noon, Monday through Friday, we can usually get your order out before our afternoon shipping pickup. If not, it should go out the next business day. We also get most of our customized orders out within 24 hours as well. 3) We Sell The Highest Quality Marine Fuel Assemblies Available! In the last 5, 10 or 20 years, most other marine manufacturers moved their production over to Asia to save money on parts and labor. These manufacturers started using cheaper hoses. cheaper primer bulbs and bargain fittings. The end result of these cost saving measures is that If you purchase marine fuel line assemblies from these low cost manufacturers you will instantly notice their hard plastic feel and cheap vinyl hoses. With cheaper fittings and hoses, these assemblies have a tendency to leak. If you put these cheaply made fuel line assemblies in a freezer overnight they will freeze solid and not work in the morning. Moving production overseas never made sense to us because we love what we do and have always enjoyed the people who work for us. So we invested in our own manufacturing equipment to make a higher quality product right here in the USA. Larand uses the highest quality products for our manufacturing. Out fittings are all precision made to very strict specifications and are always tested before shipping. We also have a proprietary formula for the rubber that we use. You can freeze the Larand Primer Bulb overnight and it will work perfectly every time as our rubber will not freeze until the temperature drops below 0 degrees. The US NAVY, NAVY Seals and Department of Forestry all use Larand because of our high quality and dependability. Want more proof? The Navy Seals recently tested the fuel line assemblies of 10 different manufacturers and decided to use Larand Marine Products as its manufacturer of custom made fuel line assemblies. It Is Certified to Meet All Applicable EPA and CARB Certifications. Our Products meet all the strictest certifications. They are all precision made to very strict specifications and are always tested before shipping. Our Tohatsu Nissan Assemblies Have A1 Quality Rubber Hose, Not The Cheap Vinyl Hose Found On Most Assemblies. In the last 2 decades, many marine product manufacturers moved their production to Asia, especially China, to save money on parts and labor. They started using cheaper hoses, prime bulbs and fittings. These cost-saving methods lead to the tendency to leak. You can test these cheaply made fuel line assemblies by putting them in a freezer overnight, and they will freeze solid and not work in the morning. In contrast, we guarantee that our fuel line assemblies still work perfectly if going through the same test. Our rubber will not freeze until the temperature drops below 0 degree. The picture shows what a full fuel line assembly looks like. It includes our high quality primer bulb, premium A1 hoses and the engine and tank connectors. The fuel line hoses are the standard 18 inches to the tank and 54 inches to the engine. You can freeze our products overnight and they will work perfectly every time as our rubber will not freeze until the temperature drops below 0 degrees. A1 Quality Rubber Hoses Won’t Kink Even In Tight Bend. You can notice the low-quality hoses by the hard plastic feel. They are easy to kink, which can reduce the pressure and flow as well as the efficiency of your boat. Unlike those hoses, ours won’t kink even in tight bend. Order Now And We’ll Ship To You Within 24 Hours! We Ship Faster Than Amazon! We make every effort to ship out orders as soon as they come in. If you order before noon, Monday through Friday, we can usually get your order out before our afternoon shipping pickup. If not, it should go out the next business day. We also get most of our customized orders out within 24 hours as well. We Can Custom Make Any Size Fuel Assemply From Any Of Our Fuel Fittings!